I am positively obsessed with pickles. I love making my own pickles, but I also love the pickle juice. 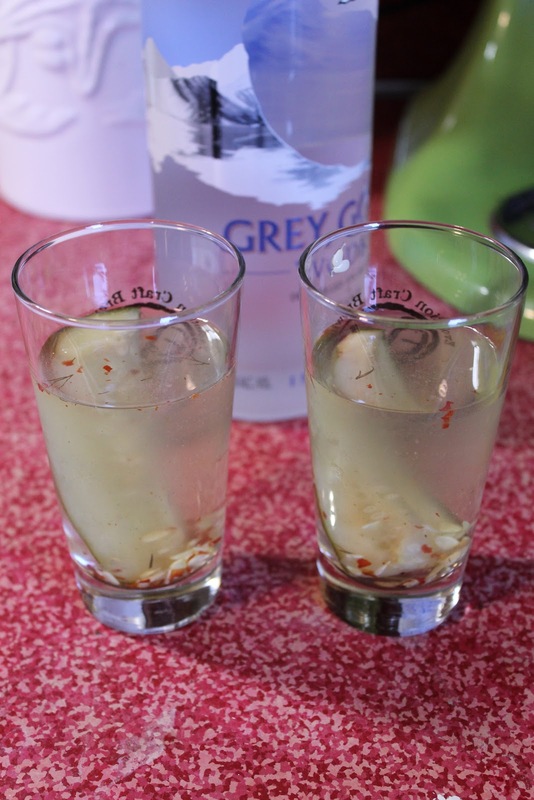 I use the juice in my bloody mary, which really gives it a *POW* of pickled goodness, but there something even easier that I love: the pickle shooter. Now, normally, I am a "let's take a shooter" kind of girl--but put pickle in it and I have a hard time saying no. Not only is this a great way to take a shooter, but it also answers that age-old question of "What to do with that leftover pickle juice??" Also? It's fast. And you can't beat fast, awesome, and pickle all in one drink now can you? Of course not. I like to use a premium vodka when I am doing a pickle shooter, and in this instance I have chosen to go with Grey Goose. Crystal Skull Vodka is also good. Since I am obsessed pickle maniac, I have also used my own pickle brine, but you can use store bought, so don't worry. I like the flavor of Claussen pickles the best, but again, use whatever you like (these are not rules, merely suggestions)! All you do for this shooter is pour equal parts vodka and pickle juice into a shaker filled with ice. For these drinks I used 4 ounces of each. Shake it up real good to chill and then..... pour! I like to garnish mine with a little homemade pickle. It tastes like the ocean in a pickled sort of way.